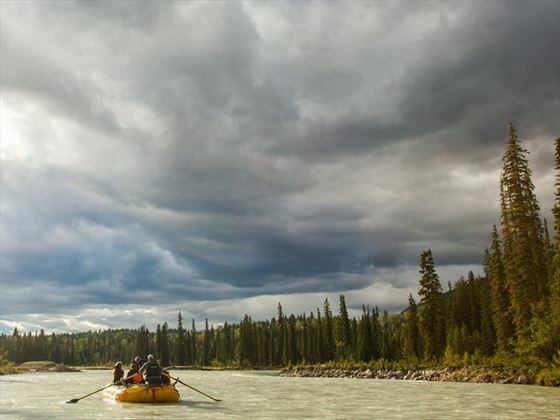 A truly exhilarating itinerary, giving the opportunity for exciting activities throughout British Columbia. 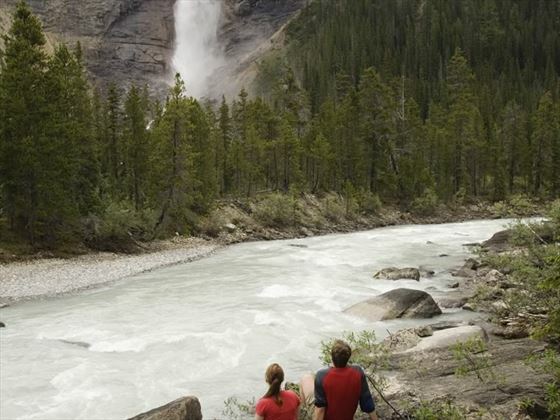 You can navigate Category 3 and 4 rapids on a whitewater rafting trip. 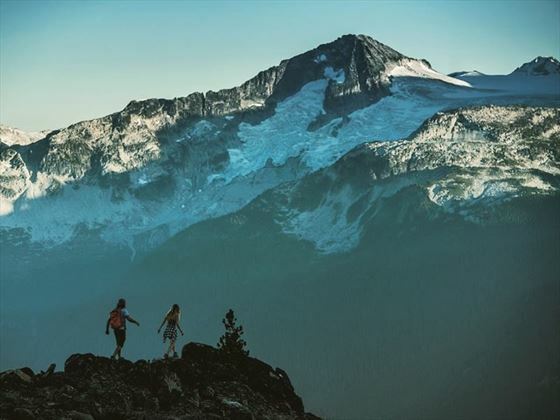 Take heart-stirring hikes through some of the most spectacular mountains in the world. Mountain bike along awe-inspiring trails – just hearing the names will make your pulse run quicker – “Punisher” and “Insanity”. 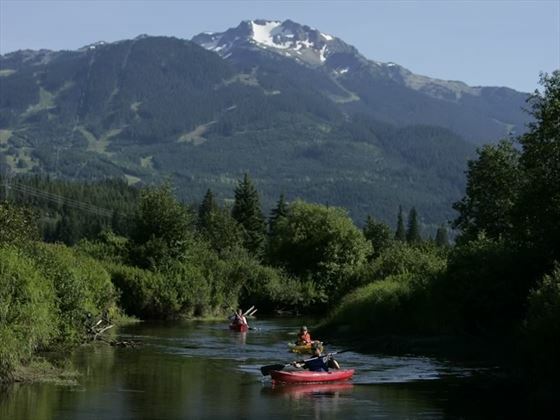 There will also be time for more relaxing pursuits such as a gentle kayak on the Kootenay Lake, a tranquil swim in the warm waters of Lake Osoyoos and a quiet stroll through ancient forests. This is a suggested itinerary that we can tailormake to suit you, with your choice of hotel, a range of activities added and as many days as you want to spend in each destination. Fly into Vancouver and transfer independently to your hotel for a two night stay. The hotels in this itinerary are our suggestions, but we can change them for any available alternatives depending on your tastes and budget. A full day to explore the sights of this glorious coastal city, and what better way to do this than by bike. We can book a 5 hour tour for you (including a 1 hour break for lunch!) which takes you to Stanley Park, along English Bay, short ferry ride over False Creek to the fabulous Granville Market where you can explore independently and enjoy lunch, then ride along the seawall along the south side of False Creek enjoying the beautiful views of the city framed by the North Shore Mountains. You’ll pass the Olympic Village and Science World and through Chinatown and Gastown. Alternatively you can book a float plane tour – an iconic way to travel in Canada. Choose from a 3 hour tour taking you to the lovely seaside resort on Salt Spring Island or a scenic 30 minutes tour with aerial views of the city, Horseshoe Bay and Deep Cove. There’s also a Zodiac tour you could take, starting slowly in the harbour before reaching speeds of 55km/h along the coastline. Time to head out of the city and into the beautiful Okanagan Valley, loved for its sunny climate and acres of vineyards and orchards. Your destination is the lovely Osoyoos Lake, with its warm shallow waters and sandy beaches. A full day to experience all that Osoyoos Lake has to offer, enjoy kayaking, paddle-boarding and swimming. Just a few minutes drive from your hotel is the Osoyoos Marina where you can go sailing, water skiing and wake boarding. Today you’re going to head west and drive along the Kootenay River until you reach the tip of the West Arm of Kootenay Lake and the hidden gem of Nelson, a city nestling at the foot of the Selkirk Mountains. Nelson has is known as one of the finest heritage cities in Canada, with over 350 heritage buildings dating back to the silver rush of the late 1800’s. You can borrow a bike from the hotel to explore or get out onto the lake on a paddle-board or kayak. Continue to follow the Kootenay River, driving along the valley with the Kootenay Rockies soaring around you. A good place for an extended lunch break is the Fairmont Hot Springs, where you can bathe in the natural hot springs where the mineral-rich waters reputedly have healing powers, but certainly have stunning panoramic mountain views. Then drive up into the mountain resort of Panorama located at over 3,800 feet. Today be as active or a chilled as you like. There is golf if you’d like to indulge in a round with unsurpassed mountain views on the Greywolf golf course. There are wonderful hiking trails, graded from easy to difficult, such as the moderate Cox Creek Trail or the difficult “Mercy Me to Summit” trail! 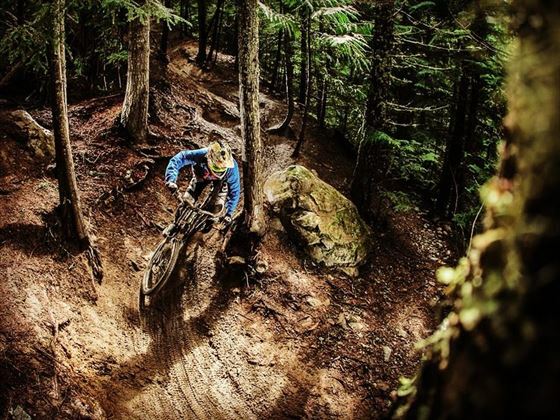 There are bike trails from the village such as the easy valley trail, or buy a lift ticket to get up the mountain to try out an easy trail such as Let it Ride or the more testing “Mercy Me” trail. Bikes are easily rented in the village centre. 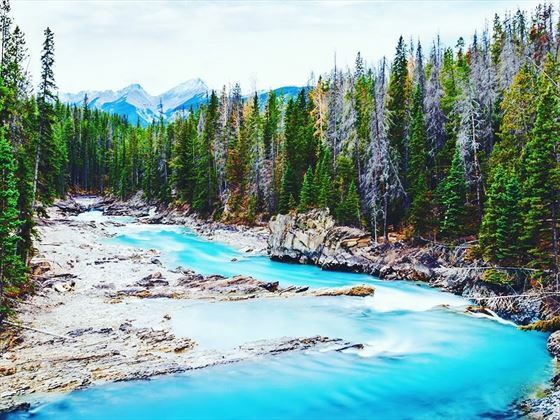 Drive back down to the valley, and to the Kootenay National Park, where you can spend an hour or two on a beautiful hike. You’ll find the village of Radium Hot Springs at the south entrance and this would be a great place for lunch after you’ve worked up an appetite on your walk. You’ll then continue up to the mountain resort of Kicking Horse. Here they have just opened a “Disc Golf” course which you might want to try out this afternoon. Instead of using club and ball you use a Frisbee and a basket. Ride to the middle station of the chair lift to access the course which overlooks the Columbia River Valley and Rocky Mountains. There are great mountain pursuits to enjoy at Kicking Horse, but perhaps you want to try out the Via Ferrata for an exhilarating adventure. Italian for "iron road", a Via Ferrata is a protected climbing route where climbers harness themselves to the steel cable fixed to the rock. We can book a tour for either beginners or those with some climbing experience, which includes a guide and all equipment. An exciting way to soak up the amazing views of the Rockies. This morning take the gorgeous drive through the Glacier National Park of Canada, and you’ll definitely want to stop at least once to have a walk. 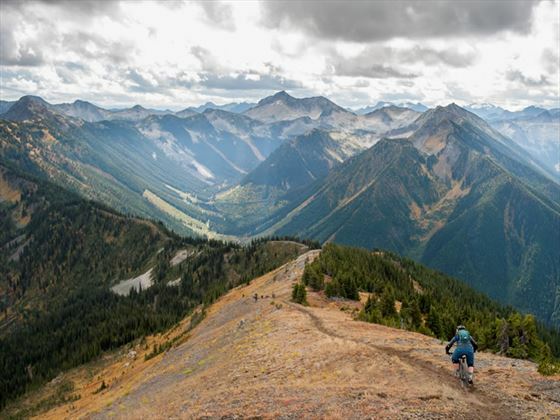 There are several trails ranging from just 15 minutes to several hours, through old-growth forests, along ridges and up to spectacular viewpoints. 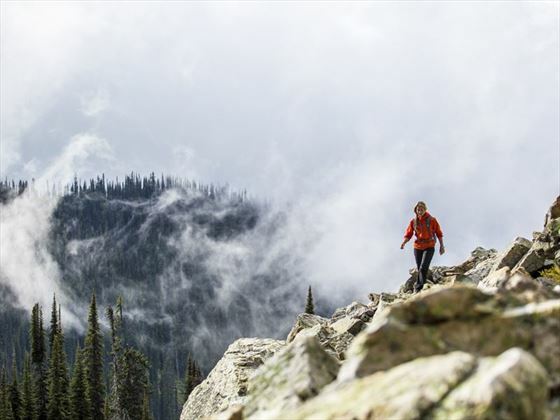 When you can tear yourself away, continue to the year-round mountain resort of Revelstoke. On this itinerary we’ve booked you into the characterful 1920’s Regent Hotel for one night but you might want to extend your stay in this lovely spot. 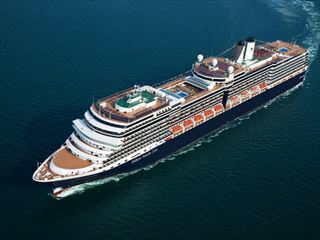 We can tailormake any part of this itinerary to suit you. This morning we’d recommend walking the Giant Cedars Boardwalk Trail through the magnificent centuries old trees. 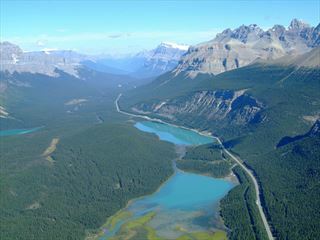 Then continue your road trip deep into the heart of British Columbia, passing by Shuswap Lake, Adams Lake and then along the North Thompson River to Clearwater, just a few miles south of the wonderful Wells Gray Provincial Park and the Cariboo Mountains. 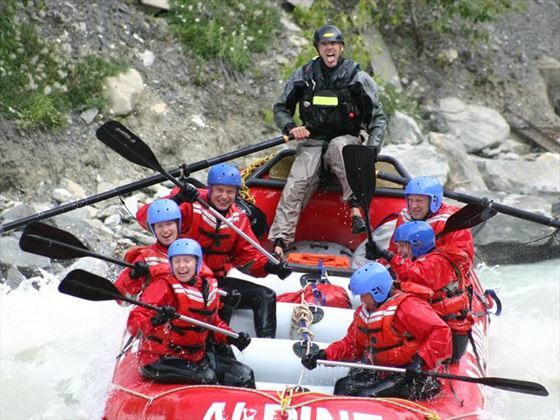 Today is the day to go whitewater rafting, and we can book a 3 hour trip for you, which includes 14 kilometres of whitewater thrills on the Clearwater River followed by a hike to The Kettle where you can see the power of an unnavigable Class IV rapid. All the equipment is provided. An intoxicating experience in an amazing setting. You can also explore the numerous hiking trails of Wells Gray Park, enjoy horse-riding or go for a peaceful paddle on Hallamore Lake. Time to head south and pick up Highway 99, the Sea to Sky Highway. 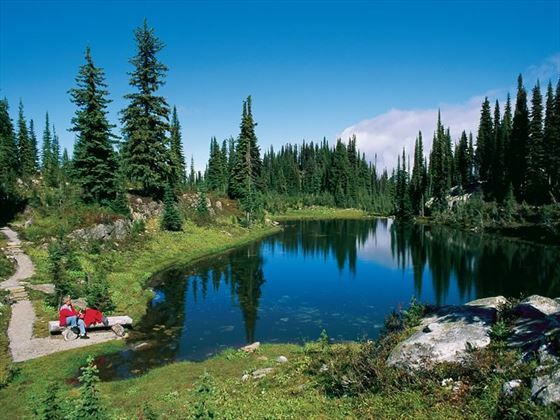 A good place to stop on the way is Joffre Lakes Provincial Parks with its three picturesque glacier-fed lakes. When you reach Whistler, enjoy an evening stroll through the lovely pedestrianised village centre to choose from the great choice of restaurants and bars. Another opportunity to go whitewater rafting, this time navigating Class 3 to 4 rapids on the Elaho and Sqaumish Rivers. Classed as being suitable for “adventurous beginners”, this exciting trip will take you through the infamous Devils Elbow section followed by the Cheeseball rapids. 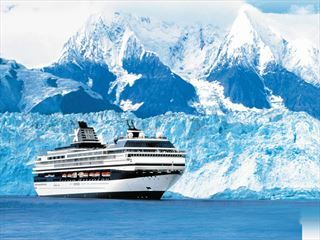 Travelling through 10 miles of British Columbia’s beautiful wilderness, you’ll be able to appreciate the glaciers, waterfalls, forests and dormant volcanoes. 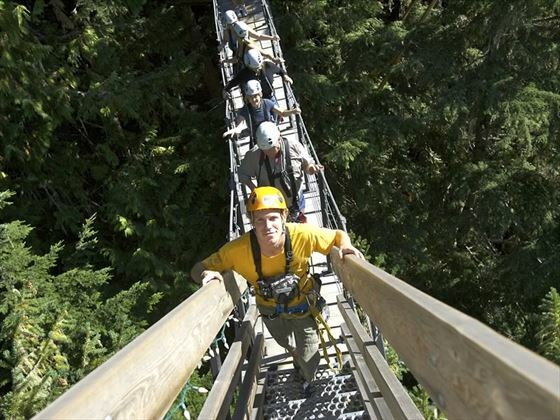 You can also go zip-lining, we can book a couple of hours experience for you with 5 zip-lines, 4 suspension bridges, boardwalks and forest trails. 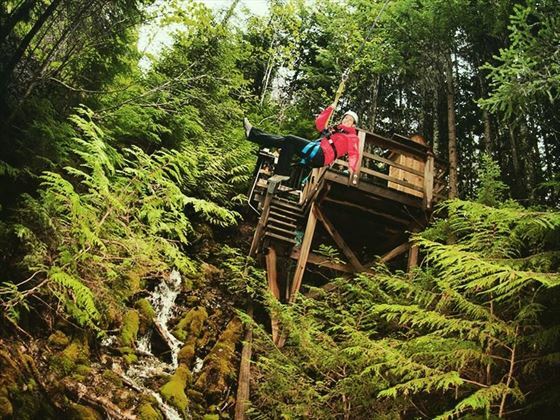 It’s time to fly home today, but you might get chance to have a final hike or bike in the Whistler area, either by ascending in the Peak to Peak Gondola or meandering through the forests and taking in sights such as Brandywine Falls and Garibaldi Lake. Then drive to Vancouver airport for your flight home.